The main function of a hose reel is to keep the hosing neat and kink free in both times of use and inactivity. Some additional benefits to the use of hose reels include preventing safety hazards to employees and customers that arise from hoses that are simply lying on the ground as well as increasing the longevity of the hose. 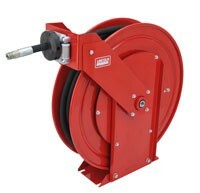 In addition to hose reels, reel manufacturers also design and fabricate solutions for electric cables, cords and ropes as well as air hose reels, cable reels, water hose reels, medical cord reels, extension reels, cable carriers and even fire hose reels, which are high pressure hose reels made for hoses that spray water, air or heavy liquids. Some applications and industries that hose reels and other reel types are frequently utilized in include: construction, in order to maintain the power cords used for various types of non-cordless power tools; medical, for various essential hospital equipment such as crash carts; and industrial manufacturing, for use in the powering of various types of automation equipment. Hose reels are manufactured to meet the specific requirements of a variety of applications. For instance, for residential applications, there are smaller versions of hose reels available that are able to house small diameter and lighter hosing such as the average garden hose. For larger diameter hoses, such as fire department and construction hoses, the hose reels will need to be built much larger and out of much more rigid materials in order to support the extra length and weight of the tubing. Another type of large diameter hose would be used in industrial manufacturing applications, in which industrial reels are used to wind the hosing as well as cords and cables used for arc and gas welding, air and hydraulic tools, industrial lighting and more. In addition, there are hose reels that are solely utilized for the transportation, while other types of hose reels can be used for both storage and transportation applications. Still, there are types of hose reels that allow the use of the hose while it is still wound up and others, known as retractable hose reels, which allow for self-contained, automatic retrieval of the unwound hosing. One of the main benefits shared by all of these different types of hose reels is that they provide easy access and storing efficiency, which is what draws the consumers towards them. There are many different design options for hose reels. One of the major variations in design that a hose reel can have is different retraction options. Different retraction options for hose reels include manual, electric, hydraulic, spring and pneumatic. For a manual hose reel, there is no automatic retraction mechanism, in its place there is a hand-turned crank. For electric, hydraulic and pneumatically-powered hose reels there is a motor that is used to power the automatic retraction mechanism. Spring-powered hose reels, however, work through different means and instead have an internal spring that is utilized in order to retract the hosing. When it comes to spring hose reels, the spring motor is often hermetically sealed in order to completely isolate it from both dirt and moisture. No matter the type of retraction option, the majority of these hose reel types come with a latching mechanism that is used to assure positive extension stop and ease of retraction at any length. Another design option for hose reels is the type of material used to construct the reel itself. Some applications require the use of a specific type of material, such as medical cord reels require the use of a sanitary grade materials such as 304L stainless steel, whereas other types of hose reels, such as industrial reels, simply require the use of a heavy-duty and corrosion-resistant type of metal, which could include variousgrades of steel, stainless steel and even aluminum. grades of steel, stainless steel and even aluminum.